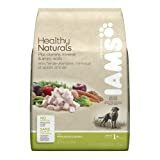 Iams Healthy Naturals with Wholesome Chicken offers natural chicken and rice for easy digestion. Like all Iams Healthy Naturals it takes nature’s goodness to provide premium nutrition with more than 9 key ingredients. It contains choice natural ingredients to nourish each of your dog’s key systems. As nature intended it has no added artificial colors, artificial flavors, artificial preservatives, or fillers.